Since the piece on Afro-Unicorn appeared, many founders have reached out asking questions on valuations. I had noted that valuation is not a science and while it makes us look great to be dropping the word “Unicorn” (a startup, usually technology-enabled, with valuation of at least $1 billion), our own moment is about $25 million and I used the term “Afro-Unicorn”. While New York and Silicon Valley with their cousins Paris, London and recently Shenzhen influence us, we are not in the same league with them. I mean, the GDP of the United States is about 40 times the size of Nigeria’s GDP. Nigeria is perhaps the largest economy in Africa. So, if Nigeria is that far behind, using purchasing power parity and common sense calibration, our unicorn number should be around $25 million. In other words, an afro-unicorn is worth $25 million. The big question is this: how do you determine what your company is worth? We have this feeling that investors in Nigeria are never helping matters. We think they do not give us the right valuation. That may not be true. What is happening is that you are comparing your startup to what you read online without taking into considerations that a business being run in an economy of say $480 billion (Nigeria GDP) will not be the same as one being run in one of $18.4 trillion (U.S. GDP). Supremacy of IP address: A U.S. based IP address has more value in the eyes of Facebook and Google for a startup that depends on advertising. Likewise, investors consider where your visitors are coming from in deciding your valuation. It can work both ways. There is a situation where a local IP address will give you a huge boost. For example, in media, where local advertisers are more likely to run ads in your platform if you have mainly Nigerian visitors over foreign visitors. In that case, you are better off being the leader in the local media sector. On the other hand, there are cases where they will prefer foreign-based IP addresses, over Nigerian ones. Everything depends on the sector and the product, but you need to have that in mind. Purchasing Power of the Customers: This is related to the above point. The US-based visitor, on average, is assumed to have a higher spending power when compared to a Lagos-based visitor (U.S. per capita income is higher than Nigeria’s). This makes the U.S.-based IP more valuable in a site where someone is selling something. It is only a person with money that can buy things. So, an investor may include that to decide how a company is worth. Again, this can go both ways depending on what you sell. The key is to have that in mind. If you are selling packaged amala, the local Nigerian IP address becomes more valuable than any coming from Tokyo. When an investor wants to invest, the location of your customers will be used to price the user base. The same applies when someone wants to acquire your business. While they may pay $30 per user in U.S., they may decide that each of your users in Nigeria is worth about $5. So, if you have one million users, you will be getting $5 million while a comparable U.S. startup gets $30 million. That is not discrimination, if there is anything like that. This is purely driven by market-forces. If that startup is in Chad with a GDP of less than $10 billion, they may even throw $0.50 per user. It is not as simple as I have noted it here, but that is the way the thinking goes. If you find a cure to HIV in Lagos, no one will care where you are located. They will pay you what your idea is worth. The valuation synthesis you see online is largely flavored for web-based business. Now, let us go through some typical ways investors use to value startups. 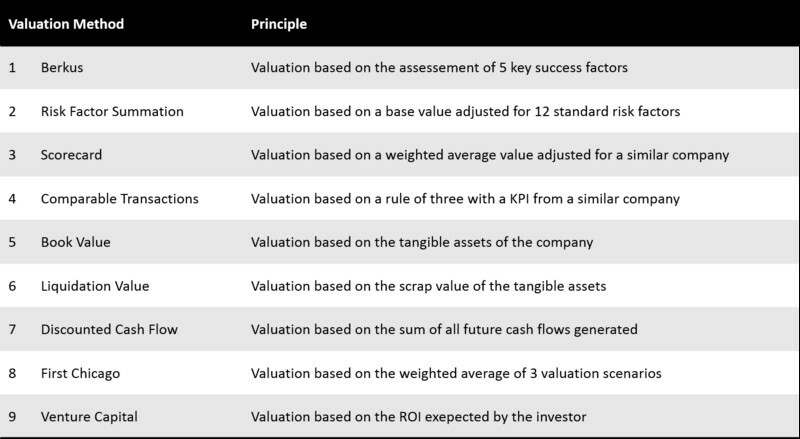 I will use Stephane Nasser’s work focusing on the pre-money valuation, i.e. before the investment is made. Most times, after the investment, the value changes because having raised that money means that risk is mitigated, and the startup can grow further, boosting its outlook and valuation. Please read Nasser’s work directly for these 9 elements. There is no need of wasting time here as he did a great job in his explanation. Yet, do not focus on valuation as you build. I will suggest you focus on creating value. But I do know that part of success is making sure that your hard work has been priced fairly by investors. Valuation is not a science. Luck plays a role here. A simple incident in the industry can make your startup extremely exciting, while new information can make it also-ran. So, when you look at the value created, you have to examine it beyond the quantitative to other elements. If you started a drone business in Nigeria and was growing it before the government technically banned it, you could have had a great company. But after the ban, it may not worth as much. The same business, but just with a week, it has gone from hot to cold.